Oh yeah, we are done meddling in and around Syria. A new bombshell joint report issued by two international weapons monitoring groups Tuesday confirms that the Pentagon continues to ship record breaking amounts of weaponry into Syria and that the Department of Defense is scrubbing its own paper trail. On Tuesday the Organized Crime and Corruption Reporting Project (OCCRP) and the Balkan Investigative Reporting Network (BIRN) produced conclusive evidence that not only is the Pentagon currently involved in shipping up to $2.2 billion worth of weapons from a shady network of private dealers to allied partners in Syria - mostly old Soviet weaponry - but is actually manipulating paperwork such as end-user certificates, presumably in order to hide US involvement. 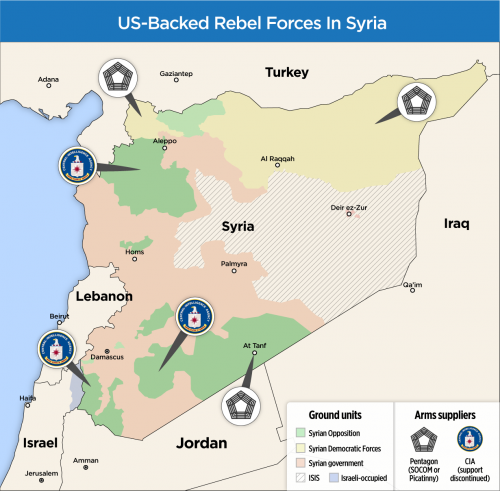 One of the authors of the OCCRP/BIRN report, Ivan Angelovski, told Foreign Policy that, “The Pentagon is removing any evidence in their procurement records that weapons are actually going to the Syrian opposition." The report is based on internal US government memos which reveal that weapons shipment destination locations have been scrubbed from original documents. \Oh yeah, America First. Just waiting to see how Trump Fanboys justify this. I think Trump and even Obama do/did want to do some of the things they campaigned on. Don't get me wrong. Trump is a salesman and Obama is a politician. These guys are not adverse to saying things that are contrary to their intentions, or saying things that are contrary what they will put up with. But there is something to the deep state "men in black" that Putin described take these guys aside and tell them how things are going to be (https://www.youtube.com/watch?v=xykvrGpCW6E). I still say that Trump could tell the public of the deep state and blow things wide open. It would be a big risk, but foul play against him and those he cares about would be proof of the powers that should not be. Could you get Vox Day to comment on "this"..? That would certainly be interesting.